Published by metropolismag.com on June 28, 2011. 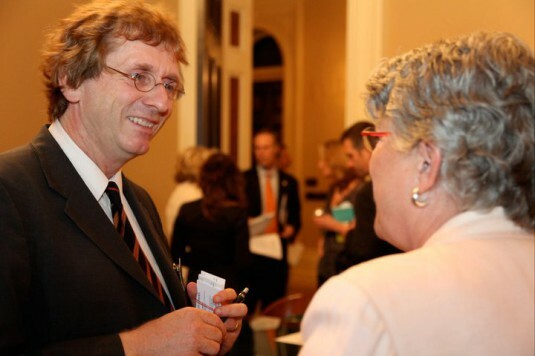 Michael Braungart after meeting with legislators in Sacramento to discuss green initiatives the state is considering. Eco-effective products and their processes should not only “do no harm,” but actually benefit the environment, people and the economy. That uncompromising design philosophy was outlined by Michael Braungart, the German chemist, and William McDonough, the American architect, in their seminal 2002 book, Cradle to Cradle: Remaking the Way We Make Things. Inspired by those principles, the non-profit Cradle to Cradle Products Innovation Institute was launched in San Francisco last year to help California crack down on harmful chemicals in consumer products, mandated by a groundbreaking 2008 “Green Chemistry” law, and promote safe manufacturing standards everywhere. So far, some 90 American companies and more than 300 products have gotten the “C2C” stamp of approval and 400 companies in the Netherlands. To ramp things up stateside, Braungart recently joined McDonough on a whirlwind tour of Northern California—his first visit to the U.S. in six years, promoting a new “C2C” website and a more streamlined, transparent certification system. Although he’s known here for collaborating with McDonough, Braungart’s been an eco-activist for the past 25 years, first as a “Ph.D. who could climb chimneys” for Greenpeace Chemistry, which he helped create, then as a founder of the Environmental Protection Encouragement Agency, an environmental chemistry research group that now has offices around the world. In addition to holding a professorship in Rotterdam, Braungart’s focusing his efforts on EPEA and the design consultancy he runs with McDonough, McDonough Braungart Design Chemistry, continuing to work with companies to profoundly change the way they make things. Joanne Furio: You met with legislators recently in Sacramento, introducing C2C to a new administration and new law makers. How were you received? Michael Braungart: I was overwhelmed by the positive response. They understand that Cradle to Cradle is about business and innovation. There was so much acceptance of Cradle to Cradle as an alternative to the way chemicals and materials are being used and accepted in California. If only 10% of the promises come true, we’ll have a Cradle-to-Cradle State of California in less than 5 years. JF: What were some of your recommendations? As you know, as California goes, so does the nation—eventually. MB: They must define their long-term goals: In three years all paper should be compostable. Right now it’s really hazardous waste. You can make paper and inks that can go in biological systems and can be composted or burned without a filter. Phosphate should be recovered from all technical processes and biological wastes in five years. Indoor air quality should be better in 10 years—better than outdoor air quality. Right now indoor air quality is three to eight times worse than the outdoor air quality of Los Angeles. Toys have to be safe for children and not just free of lead—then we find cadmium in toys and it’s 500 times more toxic than lead. In 10 years, nothing will be produced or put on the market that accumulates in breast milk. We find up to 2,500 chemicals accumulated in breast milk. It’s chemical harassment because the baby didn’t ask for it. We can really reinvent all this stuff completely. JF: The new version of C2C is being relaunched. How has it different? MB: It is more specific, and the process is as well, to make it more transparent. It also includes a lot of input from international standardization institutions—like the Japan standards institute or Jordan standards institute—to put it in standard form, which makes it more easily accepted across industries. JF: C2C has also moved the certification process from MBDC to the non-profit institute. Why? MB: We wanted to make sure that all the companies that worked with us are treated the same. Certification needs to be done by a not-for-profit organization that is accessible to everybody without any doubts or questions. Everybody can do Cradle to Cradle independently whether or not he or she is working with us [at the design consultancy]. JF: Cradle to Cradle is the most successful in the Netherlands. What is it about the culture that has made the Dutch embrace the philosophy? MB: Their culture is built on support not on control. My house in Rotterdam is 17 meters below sea level—that’s about 50 feet. If you are not taking care of your neighbor positively, you will drown as well because a third of the country is below see level. Cradle to Cradle has been adopted by companies and whole provinces, containing several million people. Provinces do Cradle to Cradle in all public buildings, kindergartens, universities. JF: C2C design principles are informing major industrial redesigning efforts in Abu Dhabi and China. Is it easier to work in such countries because they haven’t had long entrenched systems in place? MB: Yes. For example, we developed an ice cream packaging that is a film when it’s frozen. So you can throw it away wherever you are. That’s what people do there. Instead of telling people not to litter, they can throw it where they are. It’s the design that’s the problem not the human habit. Then you don’t need to build a collection system, a septic system, an incineration system. You’re basically putting things back in biological cycles. You can design the intention at the beginning. JF: There are 377 eco labels in 211 countries. What are you asking of products that other labels are not? MB: Cradle to Cradle is not an eco label, it’s a quality label, even more, it’s a community-building thing. The real thing is not the consumer but it’s a business-to- business thing first, where people agree on certain qualities—that’s the main purpose. JF: Americans have this notion that we lag behind Europe in terms of sustainability and the innovation that can result from it. Is that true? MB: No. Companies that have been pioneering Cradle to Cradle came from the U.S. because the government at the time didn’t pretend to do something. Companies like Herman Miller, Steelcase and [organizations like] the U.S. Green Building Council did it on their own, so the innovation was there. Steelcase started in ’94. We want to honor that. These companies did it because they wanted to be proud of what they were doing, they weren’t being forced by the government. Where Europe is ahead, though, in renewable energy. JF: How is the process of design for innovation different in Europe? MB: In Europe, you cannot be fired so easily and that helps creativity. In the U.S., if the company doesn’t like what you’re saying you can just be fired. If you’re afraid of being fired, you cannot be creative. Here marketing makes design decisions—that’s why washing machines look so ugly. There’s not enough respect for designers and architects—they’re just the lowest on the food chain. JF: Tell me some American companies that don’t fit that description. MB: Apple, Steelcase, Herman Miller, Shaw, Method and IDEO. There’s a whole list of companies that are really honoring and celebrating good design. These are just a few examples. JF: It’s been nine years since the book was published. Some of the products you envisioned include a “silent car that would run without fossil fuels” and soap that would require the addition of water, saving money on shipping. Tell me about other innovations that have come into being. MB: We now have Desso carpets from Holland that clean the air. Climatex Lifecycle upholstery fabric is a synthetic that’s 100% compostable. Philips has designed the first TV set, Econova, without any rare earth elements in it, and that uses 60 percent less electricity. We have been working on horizontal chimneys that use emissions, carbon dioxide, as a raw material to grow algae and feed shrimp. Method has taken EDTA out of all their soaps. EDTA creates 70 to 90 percent of the heavy metals in the waters of San Francisco Bay because is a complexing agent that never degrades and attaches to heavy metals, extracts them and puts them back into the water. JF: Looking back, anything you would have done differently? MB: I wrote “food = food,” but nobody understood it except Bill McDonough. When we published the book it became “waste = food.” But it’s not correct because nature doesn’t know waste or think about waste. It’s a human projection. JF: In a recent roundtable discussion with San Francisco environmentalists, you criticized the use of PVC in green buildings. What’s wrong with it? MB: I was in platinum LEED-certified building, for example, and this building contains recycled PVC. But the material PVC was never made to be recycled. It’s like making the wrong things perfect. Recycling PVC just makes things perfectly wrong. Recycling of the wrong stuff makes an even bigger problem out of it. There is not one good reason to put PVC in a green building. The whole life cycle of PVC is a nightmare. JF: People in the design industries are now aware of the off-gassing of materials like carpets and finishes. Tell me a source of indoor air pollution that would surprise them. MB: Laser printers. Take them out of your office. We’re taking about four years off our life span by inhaling small particulates. JF: In the book you disparage objects made from recycled plastic bottles. And yet, an iconic chair made from recycled soda bottles was a hit at the Milan furniture fair. MB: If the chair wasn’t designed for recycling it’s an example of “downcycling,” which means it probably took as much energy to convert the bottles and created as much waste as it would take to create a new one. PET plastic bottles were never designed for recycling except for now the new PET Nestle bottle, which is really interesting. JF: Can plastic really be made into a truly recycled product? MB: It can if products were designed for recycling, otherwise you’ll always have downcycling. The only company in the world that has FDA approval to recycle post consumer High Density PolyEthylene is Envision Plastics in North Carolina. The amazing thing is that the recycled material is actually cleaner than virgin material. JF: Should we even be making plastic at all, considering that it doesn’t degrade? MB: Copper doesn’t degrade and neither does stone. If it doesn’t break down it needs to be designed for the technosphere [the man-made environment], otherwise it always pollutes the biosphere. We have 12 million tons of plastic being put in the oceans every year—this is pretty stupid. JF: Americans know about organic cotton, but that seems to be where our knowledge of “quality” clothing stops. Tell me about innovations in the clothes we wear? MB: The first T-shirt that is really 100% compostable, which contains far more cotton but doesn’t contain resins and is made from a different milling technique that means it doesn’t shrink. We’ve been doing active fabrics that are cleaning the air and not just being compostable. Triumph, a world-famous company in Switzerland, has introduced the first black dye designed for skin contact, for things like bras and underwear. We don’t need to say negative things about it, we can just say it’s safe for skin contact. JF: Your philosophy about “not saying negative things” about products is quite a paradigm shift. Boasting about what’s left out—like “phosphate free” has been the basis of American marketing for the past 30 years. MB: It’s the same if we told you, ‘please protect your child: beat him only three times instead of ten times.’ You’re not protecting, you only destroy less. Trying to be less bad is about guilt management. We can do things positively. We can be good, we don’t need to be bad. JF: You don’t like a lot of the language used to describe what you call effective products. MB: It’s amazing that people want to be good for the economy, good for society, but they want to be “zero” maximum when it comes to the environment: “zero emissions,” “zero footprint.” A tree isn’t zero emissions. Carbon neutral? When you try to make less waste, reduce you’re footprint, you’re only optimizing the wrong things. JF: One of the major issues you’ve been involved in over the years involves rethinking how human waste is processed. MB: China has a long history of safely re-using waste. Phosphate, a byproduct, is far more rare than oil, far more critical, the energy problem will be solved sooner once we learn how to use the sun to break it down. How can we be so stupid so as not to put phosphate back? I was part of a team that built 150 wastewater treatment systems in Brazil where the byproduct is clean water that’s used to grow fish and pigs. It’s high tech and it only needs installation costs. A farmer can make a living running it. JF: Emphasizing the positive and your description of “combining the Western way to analyze things and the Eastern way to think in cycles” hints at a Buddhist influence. Any connection? MB: I had several days to talk to the Dalai Lama. We started a partnership and did a master plan for Taiwan with a Buddhist foundation that has 3 million members in Taiwan. Taiwan has 4,500 places to get materials back into cycles. They want to work with us on the design of products because it violates their dignity to recycle things that were not intended for recycling. So, you’re right. The Buddhist influence is a very strong one. It’s so wise and so evolved and so respecting of human dignity and life on this planet. Joanne Furio is a Bay Area writer with a focus on design and architecture for San Francisco magazine, Architects Newspaper, and the German magazine FORM. This entry was posted in design and tagged Cradle to Cradle Products Innovation Institute, Michael Braungart by joannefurio. Bookmark the permalink.